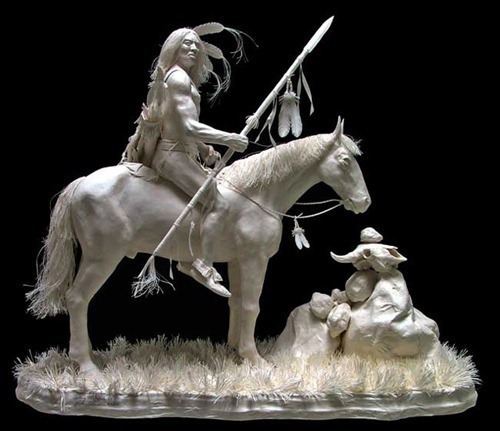 The clever artists behind these amazing white sculptures are Allen & Patty Eckman. 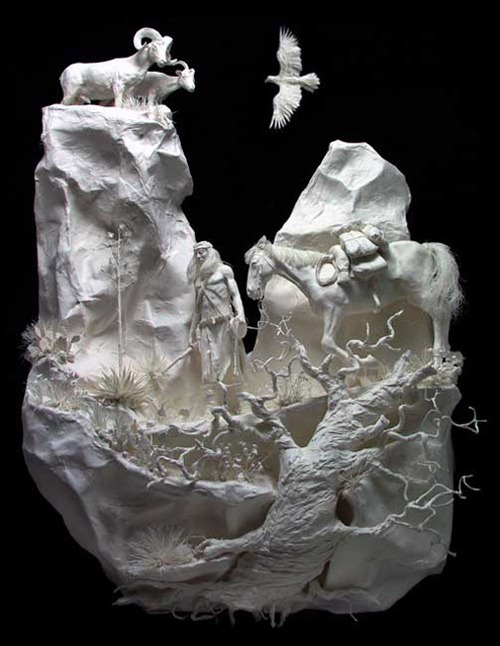 The couple met each other at Art Center College，and in 1987, they discovered paper pulp sculpture and thus set out on a whole new career path. Their work is considered to be the premier of the industry by many critics. The most expensive piece is called Prairie Edge Powwow which sold for $55,000. It depicts a buffalo hunt with five hunters, thirteen buffalo, and four women and children. It is the forth in a series telling the story of the same Lakota Indian family living around the Black Hills of South Dakota. 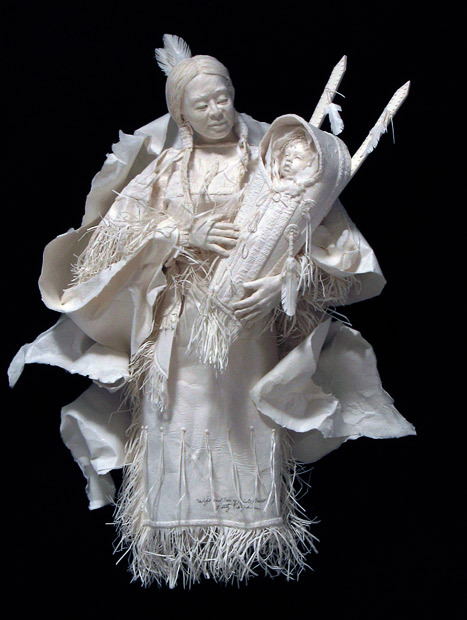 In 1987 Allen Eckman stumbled onto cast paper as a fine art medium and instantly recognized the beauty and possibilities for creating high detail, strong, acid free, pure, fine art sculpture. It took the Eckmans many years to unlock the secrets to the medium. Discoveries included paper formulation, equipment and tool innovations and their unique paper processing methods. All this was necessary to create the dimension, strength, hardness, textures and detail that are clearly visible in Eckman pieces. It takes a lot of room and special equipment including pulping stations, presses, dehydrators, tools etc. as well as years of technical knowledge just to make the paper. This print is a photograph of a subject matter the Eckmans have considered to be a personal favorite for many years, the Hoop Dancer. 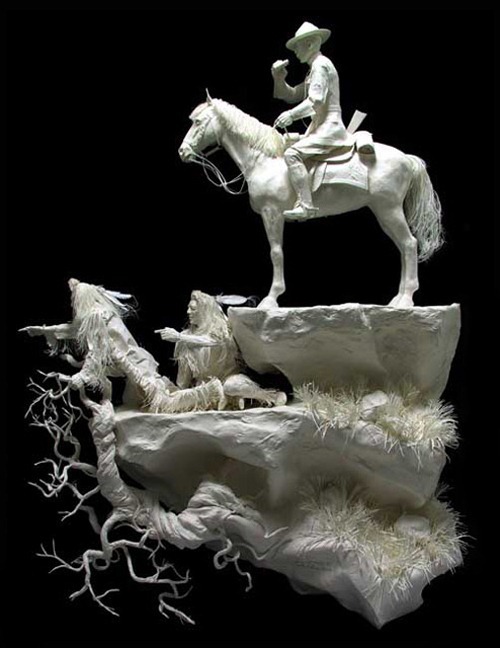 Allen created this cast paper sculpture as a commissioned, one-half life-size piece. 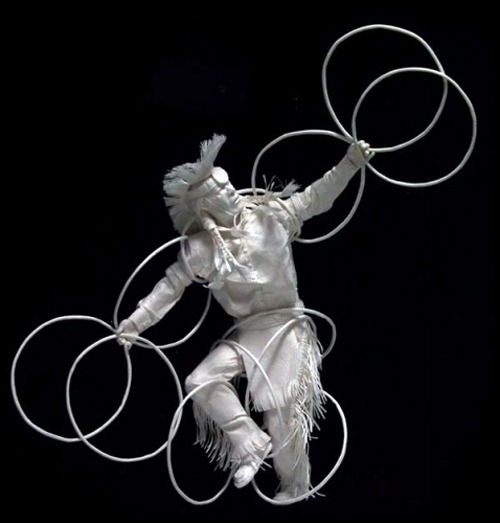 The hoop dancer is a relatively new Native American Dance category. It was developed, we are told, by a creative native in Taos New Mexico, in the 1950′s. The dance is done with as many hoops as the dancer can dance with, and is judged in accordance with their athletic ability, grace and creativity. Here, the hoop dancer is doing the eagle configuration. The print is produced on archival photo paper using archival inks. It is signed and numbered by the artist. The Eckmans first mix an acid free paper pulp in the studio hydro-pulper from two raw stocks, cotton and abica. Then cast paper pulp into clay molds, remove the water from the paper pulp by vacuum pressure, and finally take out of the sculptures from the molds and add details. The finished product is white and light weight. Allen has a great interest in the Native American Indian partly because his great-great grandmother was a Cherokee. “I really am interested in the Indian’s material, physical and spiritual culture and that whole period of our nation’s history I find fascinating. From the western expansion, through the Civil War and beyond is of great interest to me.” Eckman has expanded his work through all these subjects”. Patty has a great interest in wildlife, birds and flowers in particular. “Ever since I was a child I have had a great appreciation of wildlife. I can sit for hours and watch the birds come to my feeder. When I look at a flower I don’t see just color, I see form. Wonderful shapes that the color tries to overpower.”Patty also has interests in the Native American culture and since the year 2000 has been sculpting beautiful Indian woman and children. On large complicated and detailed works the couple often work together and both sign the piece when completed. An Indian mother holding her baby is a favorite of many clients.